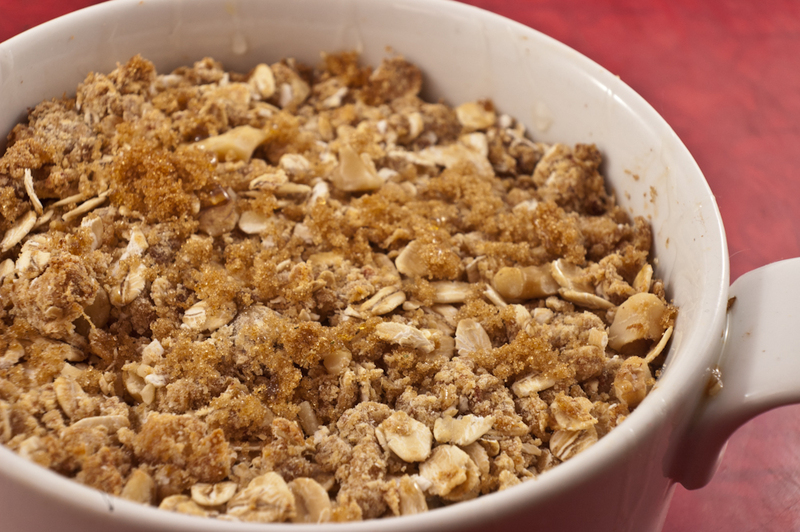 Now, I’ve had an obsession with crumble since I was a child. If it wasn’t the first thing I learned to make, then it was the first important thing I learned to make, and eating it was a regular occurrence; apple crumble every time the apples came off the tree, every time we had a Sunday roast and pretty much every time one of us felt like it and the cake tin was nearly empty. Lovely stuff. 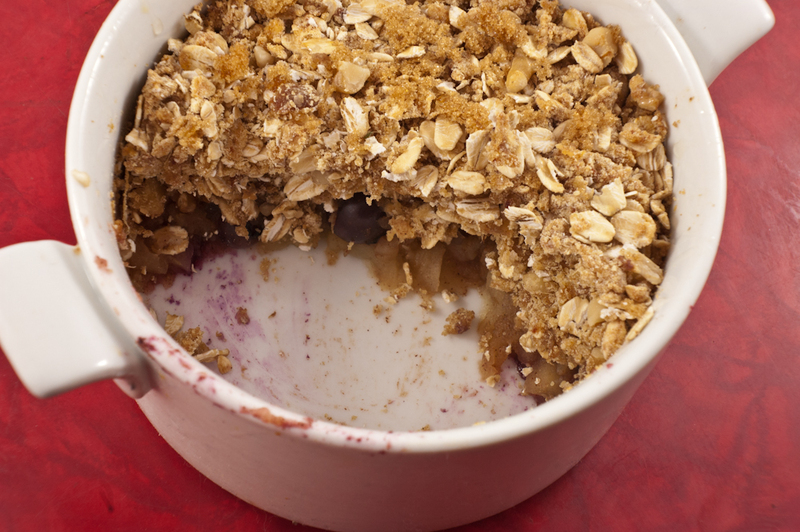 Spurred on by the success of healthy quinoa breakfast cake a few weeks ago, I set about this week creating a fat- and sugar-free apple and berry crumble that would actually be nutritionally beneficial to me, meaning I could eat it in the mornings, guilt-free. And I succeeded. Add the date paste to the mixing bowl and, using the rubbing method, combine it with the dry ingredients until it looks like – well, a crumble topping! The great thing about this dish is that you can prepare it the night before and just cook in the oven in the morning – or reheat the leftovers the next day! Both the flax and the walnuts in this dish bring a good amount of vegan-friendly omega 3s fatty acids to the table, but even better are the oats. As well as being a great source of slow-release energy and helping to regulate the blood sugar of diabetics, oats are actually a good source of protein. Oat protein is considered to be almost equivalent to milk, egg or meat protein, and, along with all the other goodness in this meal, sets you up for a brilliant day!